Anyone can browse Etsy to see what goodies are for sale. But if you’re in the market to buy, or if you eventually want to open your own shop, you need to create an account with the site by becoming a registered user. It’s easy and free! 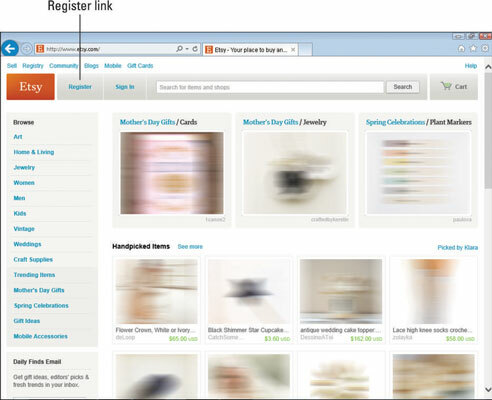 In your web browser’s address bar, type www.etsy.com and press Enter or Return. Click the Register link in the header bar. Type your first name in the First Name field and your last name in the Last Name field. Note that filling out these fields is strictly optional. If you do fill them out, your name will be publicly displayed throughout the site. If you want, you can add simply your first name, or a nickname, or your initials — whatever. If you decide to leave both these fields blank, your username is the one that other Etsy users will see. 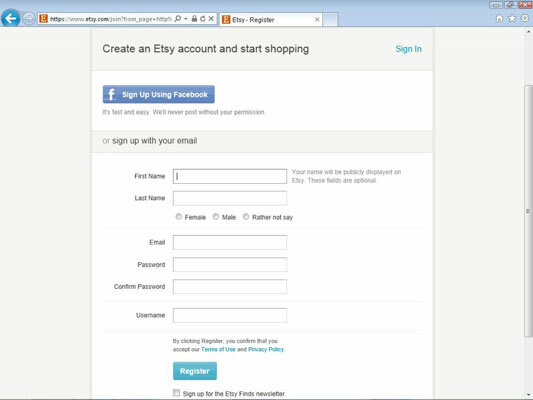 You can save a few steps by clicking the Sign Up Using Facebook button to create your Etsy account. If you do, some of your activity on Etsy — for example, when you favorite an item — may be posted on your Facebook page. In the interest of being thorough, these steps guide you through signing up for Etsy the old-fashioned way: by entering your info directly on Etsy’s site. Click the Male, Female, or Rather Not Say option button to specify your gender (or not). Type your e-mail address in the Email field. In the Password field, type the password you want to use to access your Etsy account. Create a password that’s at least six characters — one that you can remember easily but that won’t be too obvious to anyone else. In the Username field, type the username you want to use on Etsy. This name must contain between 4 and 20 uppercase and/or lowercase letters or numbers (no spaces). Etsy notifies you if someone else has selected your username; if so, try another one until you find one that’s available. If you want, select the Sign Up for the Etsy Finds Newsletter check box. If you do, Etsy will send you a daily Etsy Finds newsletter full of fantastic finds on the site. This newsletter is one of several Etsy newsletters available to you. 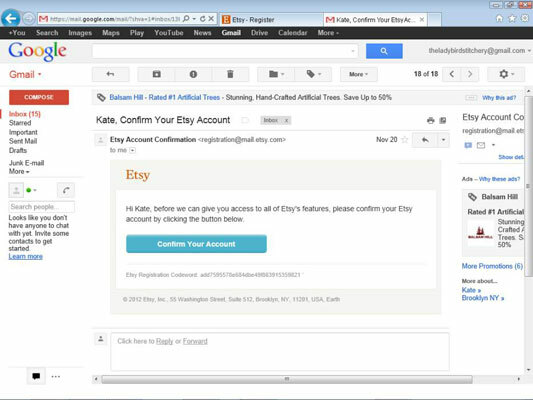 Etsy creates your account and sends a confirmation e-mail to the address you supplied in Step 5. If you don’t receive the confirmation e-mail right away, check your spam folder to make sure it wasn’t intercepted. Open the e-mail from Etsy and click the link that it contains to confirm your account. You’re ready to go! Etsy sends you a second e-mail to officially welcome you to the site.